Even if you've never been a tennis fan, you've probably heard of Billie Jean King. The 39-time Grand Slam champion became a potent symbol of the women's rights movement in the 1970s when she defeated self-proclaimed "chauvinist pig" Bobby Riggs in the 1973 "Battle of the Sexes" match. (This throwback article from the New York Daily News gives some idea of how much of a cultural circus surrounded the match.) But King had been an advocate for equal rights in the workplace long before that celebrated match, helping to gain concrete reforms in the prize money and venues offered on the women's tennis tour. Her plain language and her fearlessness in speaking out against discrimination led to her speech-filled career after tennis, and we've wanted to feature her on the blog for some time. 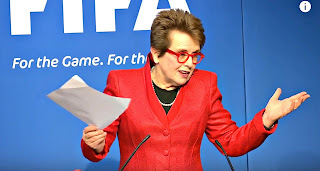 Her recent speech at the FIFA Women's Football and Leadership Conference offers an excellent chance to hear what makes her such an eloquent woman and a dynamo for equal rights. And how can we not love a quote like this, from the March 2016 speech? If FIFA wants to win, it is not enough for women to have a seat at the table. We can't just have a seat at the table. My generation worried about getting us a seat at the table. That's gone. That doesn't matter anymore. It's about having a voice at the table and being heard. Acknowledge your inspirations and partners. Many of King's speeches talk about the people who have invited her to speak or who inspired her words, and this speech is an excellent demonstration of how she weaves these contributions into a talk. Listen to her recall her conversations with FIFA president Gianni Infantino, former U.S. football star Abby Wambach and her brother, former Major League pitcher Randy Moffitt, and you'll get a sense of how King's opinions and values grew organically with the help of their input. She even reads a little from the FIFA program book for the event, and acknowledges her livestream audience (very rare to see this, but increasingly important). It feels like an interesting reveal of how the speech was put together, and I think it gives a more inclusive and informal feel to the speech--making it more of a conversation and less of a proclamation. Use the rhetorical rule of three. We've often talked about it on this blog, but if there is an opportunity to build a speech around three points, you can take advantage of the narrative and structural power this offers. In this case, King notes that FIFA is pursuing three major reforms: To bring more women into FIFA leadership; to develop a commercial strategy for women's football; and to appoint a secretary-general who supports gender equality in the sport. King thoughtfully builds her own "three observations" around these three elements. Offer a historical perspective. One of the joys of listening to a speech by King is getting to hear her stories of how sport and women's rights have changed in her lifetime. As she notes in this speech, "history is slow when you're living it," but we benefit from her historical perspective. Her FIFA talk is full of illuminating stories of inequality in the tennis world; my personal favorite is her early realization at a country club match that "tennis whites" applied to more than just the togs. By offering a look at the earlier fight for equality in tennis, she delivers inspiration and hard-won bits of strategy to the women in her audience, now fighting for an equal place in the world's most popular sport.